Looking to hit the lanes this weekend with friends and family? What you need is a new bowling ball to help improve your skills and bring down those pins. If you like to bowl or even if you are just starting out, finding yourself a new ball is a fun if a little overwhelming process. To help out, I’ve made a list of my favourite bowling balls available online. So let’s discover the best bowling ball for you! If you are looking for a reactive bowling ball, Storm is usually a great place to start. The Storm Code Black features Storm’s revolutionary R2S Pearl Reactive and finished with a 1500 grit coating. The balance of the Code Black allows for highly reactive shots, bringing hard angles to your shots. If you regularly read bowling ball reviews, you’ve probably heard the name “Code Black” come up before, reviewed favourably. The Code Black comes in 12 to 16 pounds. The Code Black has an incredible amount of back end. If you like to play outside and pull it back in hard in the final twenty, this ball is perfect for you. It also comes with the name Storm on it. Storm has offered quality bowling balls for decades, and their reactive surfaces stick around for years and years. This ball comes with an available five-inch pin if required. This is mostly for the lefties out there. The Code Black is a relatively cheap, but it doesn’t feel cheap! It hits hard and mixes the pins with great consistency, making it feel like a much more expensive ball. Highly reactive on normal, medium surfaces. If your home lanes run dry in the back 20, you may want to find something a little more toned down. Looking for your first, under $100 reactive resin? You should check out the Brunswick Rhino! The Rhino is available in a variety of colours and all the way from 10 pounds to 16 pounds making it great for adults and children. The backend is muted, allowing for smooth transitions and better control. The Rhino has a lot of great control. The bowl is perfect for a beginner trying to find their footing, and will also work well as a secondary ball for really dry conditions. The Rhino is available in an array of fantastic colours, including the fiery red/black/gold and the unique silver/green. If you are looking for a slightly customizable ball colour, this is a great place to look. The Rhino is not a fan of wet conditions. It also is not great with long, pro oil patterns either, unless your game doesn’t rely much on hook. If your house favours a medium to dry oil pattern, you find the reaction from the Rhino to be absolutely brilliant, however. The Rhino focuses a lot on control, which can lead to a sacrifice in power. The Rhino doesn’t have the same pin-mixing explosions you might hope for in a heavier handed ball like the Storm Code Black or similar. This may lead to a lot more wobbling splits than a ball with a bigger, more aggressive back end. 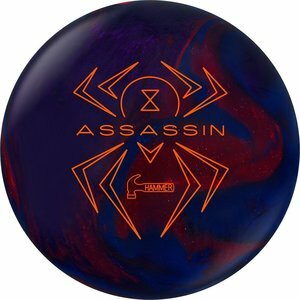 Significantly cheaper than most of the other reactive resin balls on this list, the Hammer Black Widow Assassin is a strong, aggressive ball with some really great features. Its Gas Mask Core and Powerhouse polish finish make for a very aggressive continuous hook that doesn’t roll out. Available in 15 and 16 pounds, the Hammer Black Widow Assassin is clearly one of the best bowling balls on this list. The Hammer Black Widow Assassin is a long-lasting ball with a reliable coverstock. It keeps going after hundreds of games and will last you through your league and then some. The Hammer is super smooth down the line until the Gas Mask core flips to give you the hard hook into the pins. The Hammer Black Widow Assassin offers good pin mix and heavy hitting. The Hammer Black Widow Assassin can be weak in long patterns. The ball is only available in 15 and 16 pounds. Unlike any of the other bowling balls on this list, this Ebonite Maxim is plastic. Without a reactive surface, your ball won’t find any grip on the oil to get you a smooth hook. However, this ball deserves its entry onto this list as a fantastic spare ball. It is available in almost everything from 6 to 18 pounds. It is not the best bowling ball that money can buy, but it is incredibly cheap and will serve well for newbies just getting their footing. Non-reactive plastics are the way to go for your brand new bowler. It will allow your favourite newbie to work on style, technique, and worry about hook and flair later on. The ball comes in nearly every weight you can imagine, which makes a great starter ball for a child or someone with weak wrists. Unlike most Ebonite balls, the Ebonite Maxim is prone to splitting and cracking. Depending on your play style, you may want to consider a different spare ball or starter ball. The Ebonite Maxim only comes in one colour combination, which is a pearlized, sparkling purple and blue. With its asymmetrical core and ERG reactive coverstock, the Storm Crux Pearl is a great ball for even the oiliest of conditions. The reactive cover makes for a hard-hooking and hard-hitting ball that can curve beautifully through the back end. The Storm Crux comes in a variety of weights, ranging from about 13 pounds to 16 pounds. The combination of the asymmetrical core, as well as the super reactive surface, will create swooping curves in oily conditions. The Storm Crux can be an incredibly aggressive ball on the back end, even if the lanes are flooded. The Storm Crux Pearl is a very strong contender for the best bowling ball I’ve ever used for its long-lasting shine and consistency game after game. It comes scented with a hint of Storm’s root beer scent, which is one of my favourite scents. It covers up the weird, out of the box smell of bowling bowls and adds a pleasant surprise to your bag and your game. This heavy-handed ball might be a little too strong for your house shot. However, on heavier patterns from a professional playbook, this ball is amazing. Not a good starter ball for new bowlers. For bowlers who are serious about the sport, the DV8 Creed Bowling Ball is a highly recommended purchase. It features the Creed Low RG Asymmetric as its core and 500 Siaair / Crown Factory finishing. With rave reviews from avid bowlers, the DV8 Creed comes from a reputable manufacturer based in Michigan, USA. Compared to its range of products, the DV8 definitely stands out as a clear winner. Considered one of the best bowling balls to hit the market in the last year, it is rated as a premium product that delivers exceptional performance ideal in medium oil lanes. Bowling enthusiasts can select a weight ranging from 12 pounds to 16 pounds. The DV8 Creed is top notch of its range and maintains excellent performance with backend flip. Great for rev dominant players as it is receptive to surface changes. Professional players will appreciate its pick up speed and finishing. As the DV8 is suited for those with a certain calibre of experience, it is not recommended for beginners to the game. For bowlers on a budget, look no further than the Pyramid Antidote. The Florida based manufacturer released this product in 2016 and has since received consistent reviews regarding its laneway performance. Built with the New Era 149 Symmetric Core with 2000 Grit Abralon/Factory Finish Polish, the technology for the Pyramid Antidote is carefully designed as an upgrade to other products in the range. Ideal for medium oil conditions, the Pyramid Antidote has the ability to provide maximum flare and continuation. Considered an advanced performance product, this bowling ball is available in a variety of weight, from 12 pounds to 16 pounds. Compared to its counterpart Pathogen, the Pyramid Antidote will provide an earlier, stronger, and smoother reaction. It also has a great hook and a strong backend reaction. Suitable for players who seek continuation throughout the game. While it is good for medium oil conditions, the Pyramid Antidote is not suited for use on heavy oil or dry lanes. With a wide range of bowling balls available on the market, it can be quite a task to pick a bowling ball (or two) that is suitable. Depending on your personal details such as gender, height, weight, as well as your style and technique in the game, the type of bowling ball will undoubtedly affect your performance. This is why we have compiled a guide that will assist amateurs, professionals or anyone in between when it comes to selecting the best bowling ball. Each bowler has a unique technique to the game. Some may enjoy a straight shot, while others have a fancy approach in their alley work. If you are new to the game, experiment with various tricks to find a method that suits you. While it might take you awhile to discover this aspect, it is important to take note of your evolving practice. This will help you to improve in the game, as well as in assisting your decision to purchase the right bowling ball. Depending on the management, bowling alleys are subject to different ways of maintenance. As such, the performance of your technique and bowling ball will differ under those conditions as well. If you are a regular at a particular alley or lane, opt for a ball that will respond consistently. However, if you bowl at different alleys, be prepared with two or more different bowling balls that will help you achieve successful results. For example, light oil lanes and medium oil lanes will have a direct effect on your style and gameplay. Thus, it is advised to pay attention to the types of oil patterns on the lanes. The common misconception is that the heavier the bowling ball, the better it is for the game. Unfortunately, that is definitely not the case. Participants bowl an average of 20 times during a game. For instance, if you opt for a bowling ball that is too heavy, it will inevitably cause damage as it is more difficult to throw and control consistently throughout the game. A good measure would be to practice with a dumbbell equal to a selected weight and reenact the motion of bowling. Aim for the weight to be comfortable, not too light or too heavy. Ideally, the weight of the bowling ball should not leave your arm feeling weightless or sore post-game. One of the ways recommended on Wikihow is to select a bowling ball that is comfortable and proportionate to your strength and capabilities. If in doubt, always enquire with a professional for advice. While weight is the most important factor in choosing a bowling ball, consider the pitches and grips as well. Pitches are on the surface of the bowling ball for bowlers to grip. Most bowling alleys provide bowling balls that are for a conventional grip. However, there is also the fingertip grip. A conventional grip has your middle finger and ring finger at the second knuckle, whereas a fingertip grip has your middle and ring finger at the first knuckle. If you opt to use the fingertip grip, the Bowling Guide Universe recommends using inserts to help create friction for extra power. However, if you are more comfortable without the inserts, feel free to discard them. Either way, it is simply a matter of personal preference when it comes to the grip. The most important point is that you are comfortable with the bowling ball. For beginners, do take note that there are manufacturers which produce balls with and without predrilled pitches. If it is predrilled, it is best to check if the grip is a comfortable one before purchase. The latter is a customized option for most professionals who are certain of their style and technique. At an advanced level of the game, customized bowling balls can make or break the game. For those who are new to the game, it is safest to start off with enquiries to fully comprehend and understand the requirements. Often the staff are bowlers themselves and are committed to providing solid suggestions for those who are seeking to purchase a suitable bowling ball. Be upfront with your preferences and share your concerns so that the sales staff are able to advise you accordingly. Many reputable manufacturers have social media platforms where potential customers can seek advice from the comfort of their home. While the weight of the bowling ball is the number one factor to prioritize, the next step is equally vital. Players need to consider the different types of bowling balls that is suitable for varying levels of gameplay. This is because the material for different types of bowling balls will provide a variety of experience. The results will also be dependent on your skills and expertise. To begin with, decide on what type of bowling ball required for your level of competence and learning curve. For example, complete beginners would be suited for bowling balls made of polyester, available at a budget price. On the other hand, professional bowlers with experience and particular skills would opt to have a variety of customised balls made of premium materials. These bowling balls are recommended for complete beginners, non-competitive players and those who just require a spare for fun. Durable and long lasting, plastic bowling balls are good for performing tricks and bowling at a relaxed pace. They are especially recommended for dry lanes and for players who bowl straight. Available in a range of different weights, select according to your needs. With parental guidance, these plastic bowling balls is also suitable for use by children. Price-wise, plastic bowling balls are the cheapest on the market. Polyurethane bowling balls are for those who have had some bowling experience and are looking to take their game a bit more seriously. The material allows for intermediate players to learn different bowling styles such as how to hook on light oiled lanes. This will encourage bowlers to score more strikes throughout the game. Depending on the player’s capabilities, there are different weights available. In terms of affordability, these bowling balls are considered mid-range. Bowling balls manufactured with resin will appeal the most to professional and competitive bowlers. With a powerful composition, sharp hooks, and a premium feel, resin bowling balls are recommended for oiled lanes. Expert players may opt to customize these bowling balls according to their respective needs. Do note that the material requires regular maintenance before and after use. While it may cost a lot more than other types of materials, it is often considered a long-term investment. The top bowling ball is definitely the Storm Code Black Bowling Ball. There is something incredibly special about this bowling ball. The back end of the Code Black is something you have to see to believe. Its crushing pin action collides hard and last for a long time. I look forward to bringing this ball to my normal, heavy oil, Christmas tree patterned house and watch it tear up the back 20. This is certainly one of the top bowling balls I’ve ever owned!